Nourish Argan Skin Renew Cream Now Comes In A Tube. Is It Worth The Splurge? FYI, Nourish Argan Skin Renew Moisturiser now comes in a tube. Mine’s in a jar because it’s a sample. A generous sample I’ve been testing for weeks. So I feel like I can give you my honest opinion about it. Just because Nourish Argan Skin Renew is named after Argan oil, doesn’t mean that’s the main oil used here. That honour goes to jojoba oil, a lightweight oil that’s practically identical to human sebum. You know what that means? It’s super moisturising and absorbs quickly without leaving a greasy residue behind – even on oily skin! P.S. Did you know that jojoba is pronounced “ho-ho-bah”? Palmitoyl tripeptide-5 is a peptide that boosts collagen. Or so the manufacturer says. They did a study where they asked 45 people to use 1% and 2.5% Palmitoyl tripetide-5 twice a day for 84 days. The results? This peptide reduced the appearance of wrinkles by 7 and 12% respectively. So, yeah, Palmitoyl Tripeptide may not be as useless as other peptides. The catch? I doubt there’s 1% Palmitoyl Tripeptide-5 in Nourish Argan Skin Renew. Don’t expect quick results. Related: The Truth About Peptides In Skincare: Do They Work? Argan may not be the main oil in Nourish Argan Skin Renew, but it still deserves a mention. Derived from the kernels of the Argan tree, Argan oil is rich in fatty acids that strengthen the skin’s protective barrier, deeply moisturise skin and leave it soft and smooth. Linoleic acid (one of the main fatty acids in argan oil) goes the extra mile. It also has anti-inflammatory properties that reduce redness and irritation and may even help treat acne. Related: Can You Fight Acne With Oils? The cream moisturises the same way whatever your skin type and needs are. It’s your job to tailor your skincare to your needs. If you find the cream is too moisturising for you, switch to something lighter. Don’t expect the cream to become lighter for you! To add insult to injury, there’s so little rose extract here I doubt it does anything but make the cream smell good. I wouldn’t call the texture of Nourish Argan Skin Renew thick, but it’s not lightweight either. It spreads easily and absorbs quickly on my slightly dry skin. For oily skin, it may be a tad too much. That’s not the reason why we don’t get along. I just can’t stand the scent. The frankincense is really strong and overpowering. It lingers around for ages and… it’s just not my taste. If you can put up with it (hey, your scent taste may be so different from mine, you dig this stuff), it does a great job at moisturising skin. I used it at night and, after every application, my skin was softer and smoother. The cream also plumped up my skin, so my fine lines looked smaller. Most importantly at this time of the year, it strengthened my skin’s protective barrier so the cold winter winds can’t dry it out as much as they’d like to. Without a good moisturiser, my skin’d be flaky now. I’m pretty happy with the moisturizer. But please Nourish… tone down the scent a notch or two! 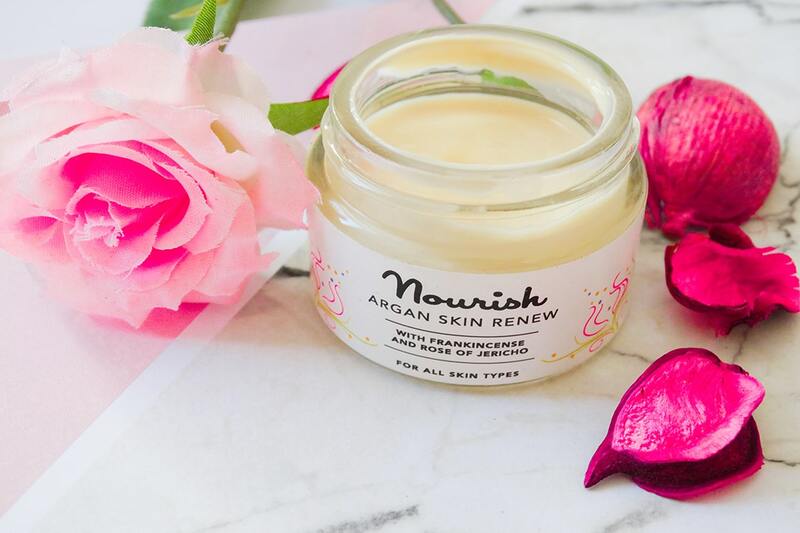 Nourish Argan Skin Renew is a wonderful moisturiser for dry skin: it makes skin softer and smoother, strengthens the skin's protective barrier and reduces the appearance of wrinkles. But it's too heavy for oily skin and the scent is very strong. Have you tried Nourish Argan Skin Renew? Share your thoughts in the comments below. Ingredients: Aqua, Simmondsia Chinesis (jojoba) Seed Oil*, Helianthus Annuus (sunflower) Seed Oil*, Glycerin*, Cetearyl Alcohol, Palmitoyl Tripeptide-­‐5, Cetearyl Glucoside, Sodium Levulinate, Levulinic Acid, Argania Sponosa Kernal Oil*, Selaginella Lepidophylla (rose Of Jericho) Extract, Lactobacillus Ferment, Crambe Abyssinica (abysinnian Kale) Seed Oil, Borago Officinalis (borage) Seed Oil*, Rosa Caninca (wild Rose) Seed Oil*, Cetearyl Olivate, Sorbitan Olivate, Glyceryl Sterate, Sodium Hyaluronate, Aloe Barbadensis (aloe Vera) Leaf Juice Powder*, Tocopherol, Boswellia Carterii (frankincense) Oil*, Potassium Sorbate, Bisabolol, Zingiber Officinale (ginger) Root Extract, Commiphora Myrrha (myrrh) Oil, Limonene. *organic Ingredient.